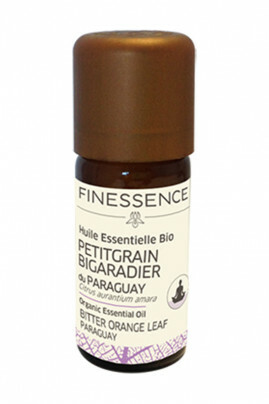 The relaxing and soothing powers make Finessence Organic Bitter Orange Leaf Essential Oil, a natural anti-stress! It soothes daily tensions and fights morale downs. It also promotes sleep and fight against insomnia. Its tangy and fruity smell invites relaxation and immediately gives a feeling of sweetness and comfort. In cosmetic care, it is generally used to regulate excess sebum thanks to its purifying properties. She is the ally of skins and hair with a tendency to fatness. Relaxation and relaxation are the key words of the Finessence Organic Bitter Orange Leaf Essential Oil. How to use the Organic Bitter Orange Leaf Essential Oil? Atmospheric diffusion: Depending on the diffuser and the size of the room, add between 5 to 30 drops of essential oil. Refer to the manual of your device. Cutaneous application: Pour 4 drops of essential oil for 1 teaspoon of vegetable oil of your choice. The massage is preferred on the solar plexus, the stomach, the lower abdomen or the lumbar according to the problems. Infusion: To take advantage of its soothing virtues, mix 3 to 4 drops (diluted beforehand on a sugar) in a liter of lukewarm water. A natural formula with calming virtues!